Happy Birthday Card with NEW Products Sneak Peek! Come and take a peek at some brand new products that will be available in the Occasions catalog that launches on January 3! This beautiful Scattered Sequins Dynamic Textured Impressions Embossing Folder is so much fun! And of course this Metallic Edged Ribbon in Berry Burst is one of my new favorites, too! Both of these products will be available to customers starting January 3rd, however if you’re itching to get your mitts on these early, you can click on the Join My Team link and sign up to be a kit-napper, hobbyist, or Independent Demonstrator. 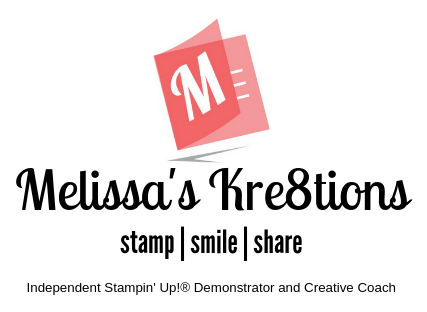 No matter which option you choose, you will be invited to join my exclusive Facebook group, Melissa’s VIP Stamp Lounge as well as gain access to my demonstrator only Facebook group where I provide my team with the opportunity to join in on SWAPS, trainings, and more! Have questions? Feel free to contact me via e-mail or through Facebook. I’d be happy to talk to you more about what the Stampin’ Up! opportunity could mean for you!